Microsoft PowerPoint is a powerful tool to build effective presentations for various purposes. The tool is the most used presentation software for the past two decades and remains to stay so. 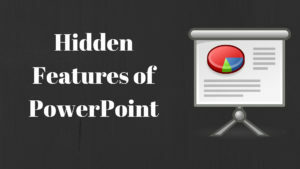 Even though people have been using it for a long time, most of them are unaware of some of the useful features of Microsoft PowerPoint. 1) Increase Number of Undo Actions: People make mistakes in life, but that can’t be undone in any way. But, when one is making mistakes on any of the Microsoft Office tools, he/she is allowed to undo the mistakes, and correct them, up to 20 times. But, did you know that this limit of undo’s is by default and can be extended in PowerPoint? Yes! In PowerPoint, the undo action can be adjusted according to the need, from the Advanced section of PowerPoint Options. 2) SlideShow Mode’s Zoom Feature: This feature of Microsoft PowerPoint can be a boon for the presenters, as in the complex slides, the presenter can represent a particular part of the slide, by zooming it in, with more clarity and in a defined way. For the zooming effect, the user can use the magnifying glass given at the bottom. 3) Custom Autocorrect Shortcuts: PowerPoint provides you with another useful feature that is the autocorrect feature. It allows the user to write faster as the user does not need to write the whole spelling for every single word. The Autocorrect feature can be selected from the Proofing option. 4) Customize Accessible Features with the Quick Access Toolbar: The Quick Access Toolbar is similar to a Ribbon that contains various commands on it. The user can customize the Toolbar by adding or removing the commands from the toolbar. Quick Access Toolbar is helpful in increasing the efficiency and speed of working. 5) Convert SmartArt to shapes: Sometimes the user wants to use the shapes alternatively of SmartArt Graphics. The shapes are smooth to use and customize. In PowerPoint, the SmartArt graphics can be transformed into shapes through the Convert to Shapes option in the Design feature of the SmartArt Tools. 6) Recover Unsaved Presentations: With the latest version of Microsoft PowerPoint, the user is able to recover the unsaved files, that got stopped or closed, due to some certain reasons and before saving. One just has to go to the Open menu on the top bar and look for the Recover Unsaved Presentations option, at the bottom of the menu. By clicking on the option, the recently closed file will be recovered and opened. 7) Screen Recording: The Microsoft PowerPoint also allows the user to record and embed the information from the computer screen to the PowerPoint slides. The user can record the required activities on the desktop and put it into the slides. The recording can be accompanied by audio in the background. 8) Shortcuts and Hotkeys: Every Microsoft Office user is aware of the common shortcuts and hotkeys available on it. But, PowerPoint has another list of shortcuts and hotkeys, that can help to reduce the time and enhance the efficiency of a PowerPoint user. 9) Layout Building: Microsoft PowerPoint allow the user to select layouts from a long built-in list of different layouts. But, those boring layouts are outdated and make the PowerPoint presentations look boring. Another hidden feature of PowerPoints lets the user to trash those oldie layouts and create their own new ones with the help of images and graphics. 10) Sound Recording & Sound Upload: PowerPoint supports recording and uploading audios to the slides, through a built-in PowerPoint recorder. This feature is most useful when the presentation is to be done independently. The user can find the Sound Recording and the Upload option in the Insert menu of PowerPoint. While creating a presentation, PowerPoint has been the first preference for every person. But, still, there have been many secret features that people still need to know about. So, keep on using this wonderful tool, to create the presentation on it and unfold more secret features that to increase the efficiency of the creator and the effectiveness of the presentation.